When it comes to car safety and tips for sharing the road, winter requires even more vigilance and awareness. Winter temperatures create hazardous conditions for neighborhood sidewalks often prompting runners to take their workout to the road. Practice vehicle safety by keeping your eyes on the road and off your device. Learn ways you can practice being a courteous, safe driver this winter to protect yourself and others. Why do runners like to run in the road? Many motorists question why runners hit the road when sidewalks are available. Well, in the winter, often sidewalks aren’t available because of icy, hazardous surfaces. Other reasons runners hit the road? The asphalt surface of roads is much easier on runners’ legs. The hard cement of sidewalks takes more of a toll on the body than asphalt surfaces. Why aren’t they on treadmills? Running on a treadmill (or indoor track) is good for fitness, but you don’t get that lateral strengthening that you get when you’re outside. 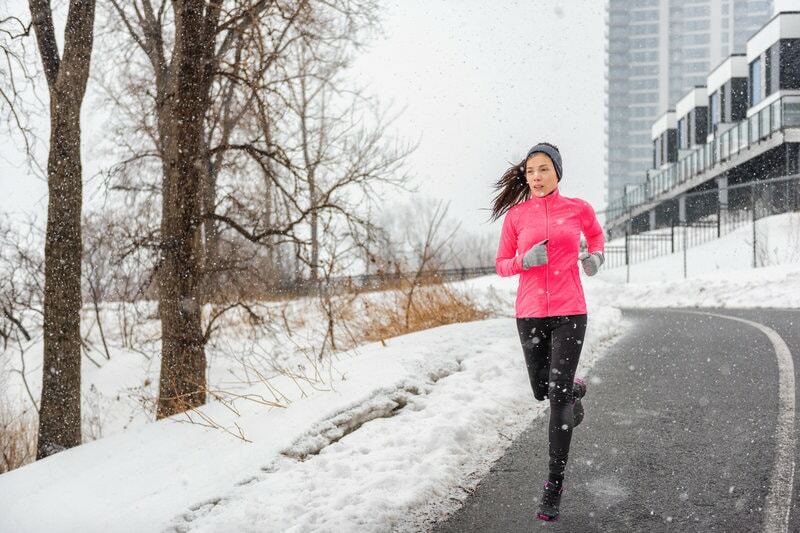 For long-distance runners, logging mile after mile on a treadmill just doesn’t compare to breathing the crisp winter air and feeling the sun during a run. More runners can be found running in the dark during winter as well since there are less daylight hours in winter than in the other months of the year. This means that motorists have to be extra careful during the early morning hours and evening hours. While runners are encouraged to wear reflective clothing, they don’t always or it may be difficult to see. Again, be aware and give runners space. Car Safety: What should motorists do with runners on the road? Runners are advised to wear bright clothing, run against traffic, stay on the shoulder of the road, and always strive to make eye contact with the driver. Motorists as well have a role to play to keep runners safe and prevent accidents. Stay aware. Eyes up when you are driving, not down looking at a device or anything else. Give them space. If you see a runner approaching, get over a lane if you can to give them as much room as possible. If a lane to your left or right is not available, try to stay as far away from the runner as you can to give them space. Watch for sporadic movement. Runners may dodge an area of the road that brings them even closer to you. Drive defensively so you can avoid a collision. Be courteous. It does no one any good to be frustrated if you have to share the road with a runner. Roads are there for everyone to use so be respectful. If there is a crash between a driver and a runner, who’s at responsible? Officers called to the scene will conduct an investigation, examine the evidence, including damage to the vehicle, any property, skid marks, etc) and interview the driver, the pedestrian or any witnesses before determining a guilty or not-guilty verdict. Pedestrians (including runners) should try to stay on sidewalks if conditions permit, but when they don’t they will be found on the roads and it is lawful for them to be there so, again, be aware. While laws are intended to keep pedestrians safe and prevent them from being hit by vehicles, unfortunately, not all drivers are aware of or abide by Colorado pedestrian rights-of-way laws. Take steps now to keep both you and runners on the road safe by being aware and abiding the law. Share the road safely by keeping your car working! Another way to share the road safely is to make sure your car remains in good working order. If you need vehicle maintenance or repair, please contact Scott’s Fort Collins Auto today. You can schedule an appointment online or call (970) 682-4202 to arrange your next visit.